Through her work, Justine Varga examines the mechanisms of the photographic medium and the way a photograph retains the trace of its subject. Using camera-less photographic techniques as well as analogue lens-based processes, Varga produces images that offset the speed of the digital snapshot. 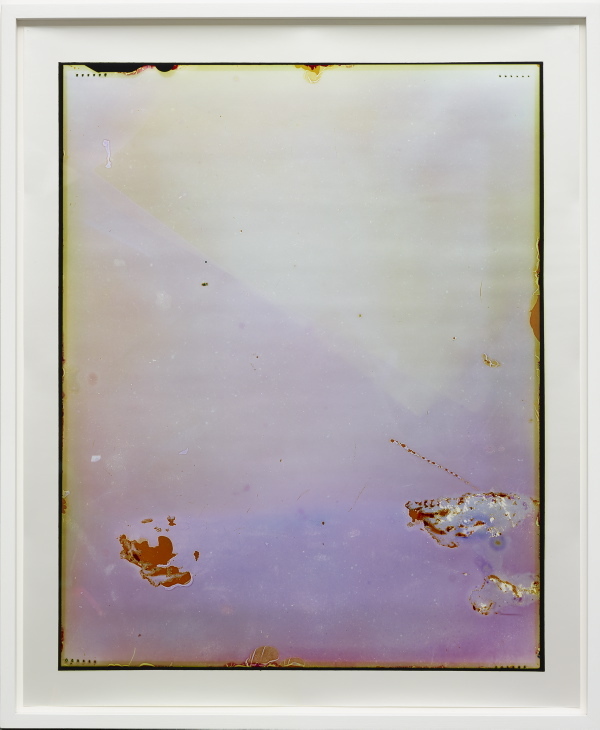 She challenges the notion of the photographic instant, sometimes exposing a single piece of film for six months or more. ‘Desklamp’ from the series ‘Film object’, a camera-less photograph, is an image produced by an exposure that lasted nearly an entire year. Over that time, a 4x5 inch large format film negative was placed on top of Varga’s desk lamp. Without a lens or shutter to control the exposure, the negative has been severely overexposed. This image does not operate like a normal photograph. In the place of recognizable form and referential composition there is abstraction. By overexposing the negative, Varga surrenders the image to what is ordinarily considered a technical error. A mistake that usually results in the obscuration of a subject has become the desired means of representation. The degradation of the negative has become a compositional feature. What is imprinted on the surface of this photograph is not derived from a single ‘take’ but is an aggregate of an extended instant. This still image is a static record of an object, the desklamp, over an extended period of time. In the ‘Still life’ works, also from the ‘Film object’ series, camera-less photographs appear alongside more legible scenes made with an analogue camera. ‘Still life #2’ was created in the darkroom by exposing the photographic paper to light without a negative. This minimalist photogram reduces the photographic process to its simplest terms. ‘Still life #3’ plays to the conventions of photographic representation. The fruit delicately arranged on the table recalls the composition of a still life by Jean-Baptiste-Siméon Chardin. Yet even in this image there is something obscuring the forms from view. A piece of plastic has been draped over the fruit like a fine veil. In subtly masking this scene, Varga continues to question the function of the photographic image, exploring a photograph’s communicative potential beyond the constraints of straight representation. Signed and dated l.r. verso, pencil "... 2012 ... J Varga".